At Frenchette in Tribeca, chefs Lee Hanson and Riad Nasr have created a modern brasserie. 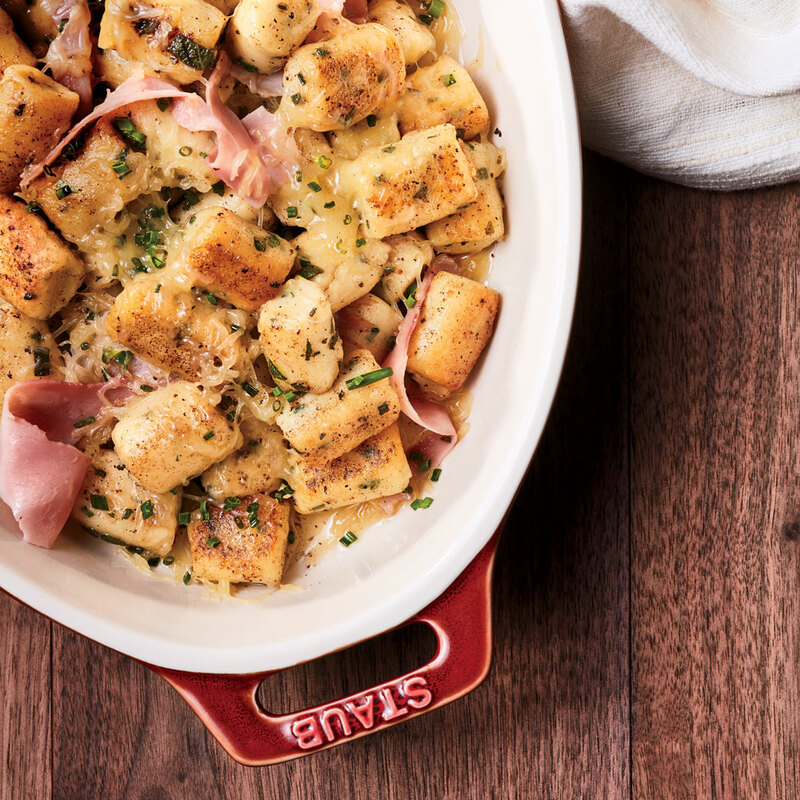 This Gnocchi Parisienne is their take on a French pasta: Poached pâte à choux dumplings crisped in brown butter and topped with ham and cheese make a rich entree or a showstopping side. Even better, the dumplings can be poached ahead of time, making assemply a snap. Bring 2 cups water, 3/4 cup butter, and salt to a boil in a large, heavy-bottomed saucepan over medium-high. Remove from heat, and add flour all at once. Using a wooden spoon, stir vigorously until a ball of dough forms. Cook over medium, stirring constantly, until dough begins to leave a film on bottom and sides of pan, about 4 minutes. Remove from heat, and stir in 3/4 cup cheese until blended. Transfer dough to bowl of a heavy-duty stand mixer fitted with the paddle attachment. Beat on low speed until no longer steaming, about 2 minutes. Add eggs, 1 at a time, beating until incorporated after each addition. Add chives; beat until combined. Refrigerate dough until chilled, about 1 hour. Bring a large pot of water to a simmer over medium-high. Scrape chilled dough into a piping bag fitted with a 3/4-inch round tip. Carefully pipe dough into simmering water, cutting at 1-inch lengths with a paring knife or scissors. Once gnocchi rise to surface, cook until slightly firm, about 1 minute and 30 seconds. Using a spider, transfer gnocchi to a baking sheet lined with plastic wrap. Heat 1/4 cup butter in a large skillet over high; cook until foam subsides and butter begins to brown, about 2 minutes, occasionally scraping bottom of skillet with a wooden spoon. Add half of gnocchi and 1 tablespoon sage; cook, tossing occasionally, until gnocchi are slightly browned and heated through, about 3 minutes. Transfer gnocchi mixture to a medium bowl, and set aside. Wipe skillet clean, and repeat procedure with remaining 1/4 cup butter, remaining gnocchi, and remaining 1 tablespoon sage. Return all gnocchi mixture to skillet. Reduce heat to medium, and add up to 1/4 cup remaining water, 1 tablespoon at a time, stirring constantly, until gnocchi are glazed, 20 to 30 seconds. Spoon gnocchi into large gratin dish; sprinkle with remaining 3/4 cup cheese and additional chives. Top with ham.